One of the most noticeable, first impressions about any business can be its name. It's that signpost that says who it is, what it is about and gives a sense of what customers can expect. With the name Bula Vinaka, you are right in expecting and receiving a heartfelt welcome at this new Red Hill cafe. You see, Bula Vinaka means a warm hello in Fijian. And that's exactly what I experienced when I stopped by the recently renovated, sunlit cafe which sits at the base of Fulcher Road, Red Hill. It replaces the former Arthur's Green Café which closed its doors in late 2018. With a fresh coat of paint and clean refurbishment, the new look Bula Vinaka opened its doors in February 2019. 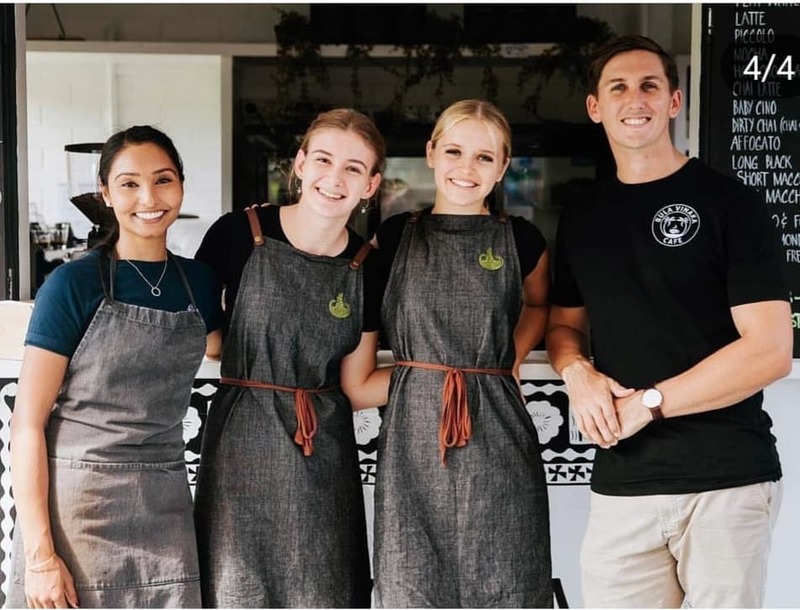 It's hardly surprising to find that many of the features of Bula Vinaka Cafe reflect the Indian/Fijian heritage of former school teachers and owner-operators Manshika Singh Furminger and husband James. Apart from the obvious clue of the name, the next hint was the black and white logo below the counter which has a south pacific feel and features the image of a sea turtle. The next hint was when I stepped up to the counter, ordered my Campos Coffee grabbed a seat and received my table number which was written in Fijian. One is Dua, two is Rua and three is Tolu etc. The cool reggae tunes coming out of the speaker helped to create the feel and vibe of a laid back island. Since opening for business in February, Bula Vinaka's menu is simple, still evolving and very reasonably priced. Alongside light café favourites such as croissants, scones or toast with jam and cream, the weekend menu includes the addition of acai bowls with seasonal fruit ($14.50) and noodle cakes with house relish and chickpea salad ($9.50). For yummy treats, looks out for the house banoffee cupcakes and the house red velvet cupcakes. Expect some authentic yet modern Fijian menu offerings as the café settles in and further expands its offerings. The cafe has lots of level seating from street level. Shade sails and outdoor umbrellas provide cover over the long, wide white tables (which seat 6-8 guests) and faux grass gives a soft landing underfoot. Bula Vinaka is in the fortunate position of overlooking the lush Bowling Green of the Red Hill Community Sports Club which apart from being a Bowls Club, also caters for over 20 different Community Groups. The best thing about the location is hugged by the winding waterways, creek beds and bike paths of Ithaca Creek. The tree-lined bike paths provide the chance to walk, run or cycle off breakfast and enjoy nature at the same time. If you decide to arrive by car, a parking space is situated beside the cafe. For public transport options, buses also run along nearby Waterworks Road. Overall, Bula Vinaka was true to its name. It had a comfortable, relaxed, laid back vibe and is worth checking out when you are passing through Red Hill.